Lockheed Martin's Quiet Supersonic Technology (QueSST) concept's unique design would allow it to separate the shocks and expansions associated with supersonic flight, resulting in a soft thump rather than a disruptive bang. NASA is building a new X plane with the goal of deadening the loud thunderclap that jets make when they travel faster than sound. Those noisy sonic booms are one of the reasons supersonic planes aren't used commercially today. The Low-Boom Flight Demonstration program will build the new experimental aircraft and then fly it over cities to see if it's quiet enough to satisfy residents and regulators. The reason supersonic aircraft generate sonic booms is complicated, but there's a simple way to think about it: "A sonic boom happens because the air doesn't know the airplane is coming," says Peter Coen, manager for the Commercial Supersonic Technology Project in NASA's aeronautics mission directorate. When a plane travels toward you at speeds below the speed of sound, you can hear it coming because the sound wave is moving faster than the plane. But when the plane breaks the sound barrier, it slams into the air without any warning. This creates multiple shockwaves. Those shockwaves converge as they travel to the ground, causing what sounds like a bang. But by making small adjustments in the shape of the nose or canopy or wings, you can smear out that shockwave, "so instead of a bang, you just hear a thump," he says. The main feature of this new, supersonic test plane will be a long pointy nose. "Supersonic aircraft tend to be long and slender," says Coen. "Low boom supersonic aircraft is that to an extreme." Designers are also thinking about the environment the new plane will fly in. Aeronautical engineer Douglas Hunsaker of Utah State University uses computers to estimate how supersonic shockwaves move through the air. He says weather can be a big factor in the size of a boom. "In fact humidity affects it a lot," he says. Hunsaker says his colleagues at Texas A & M University are testing metal alloys that would allow a plane to change shape in the air that would mitigate the sonic boom depending on changing weather conditions. That work is separate from the NASA project announced this week. The new X plane is the first experimental jet built by NASA in more than a decade. "The thing that I'm most excited about is that NASA is moving back to this X plane concept," says Bobby Braun, dean of engineering at the University of Colorado in Boulder. He says experimental planes have been crucial to advancing aviation. There's been no commercial supersonic travel since the European-built Concorde passenger aircraft was retired in 2003. But Braun believes it may make a comeback. "It wouldn't surprise me at all, if say 10 years from now, starting with supersonic business jets, and then moving into larger commercial aircraft that we're back flying supersonically," says Braun. NASA has signed a $247.5 million contract with Lockheed Martin Aeronautics Company of Palmdale, California to build the new X plane. The agency expects delivery by the end of 2021. Aircraft make loud sonic booms when they fly faster than the speed of sound. That thunderclap is one of the main reasons supersonic planes aren't used commercially today. Now NASA is building a test plane to evaluate ways to reduce that boom. NPR's Joe Palca has more. JOE PALCA, BYLINE: The supersonic test plane doesn't look all that different from a more conventional plane except for a long, pointy nose. 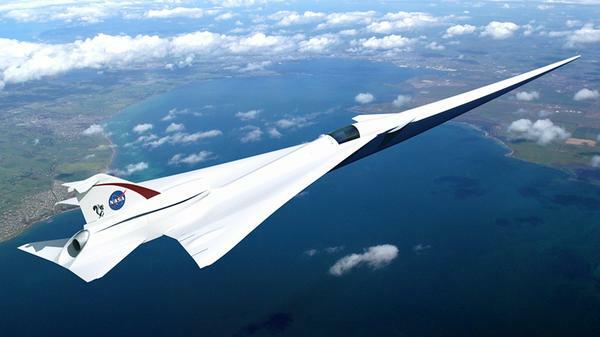 PETER COEN: Supersonic aircraft tend to be long and slender anyway. Low-boom supersonic aircraft is that to an extreme. PALCA: Peter Coen manages NASA's Commercial Supersonic Technology Project. When he says low boom, Coen means low sonic boom. COEN: So instead of a bang, you just hear a thump. PALCA: Coen says the bang comes because a supersonic plane creates shock waves that converge as they reach the ground. COEN: There's shock waves from the nose of the aircraft. There's shock waves from the canopy, the windshield, the wings. PALCA: By making small adjustments in the shape of the nose or canopy or wings, you can sort of smear out that shock wave so it has less of a punch. Aeronautical engineer Doug Hunsaker says you don't have to make dramatic adjustments. DOUGLAS HUNSAKER: Very small changes to the aircraft can have actually a very significant impact on the sound that you hear on the earth. PALCA: Hunsaker is at Utah State University. He uses computers to estimate how these shock waves move through the air. He says weather has a big impact on that movement. HUNSAKER: In fact, humidity affects it a lot. PALCA: Hunsaker says his colleagues at Texas A&M University are testing metal alloys that would allow a plane to change shape in the air. That would mitigate the sonic boom depending on changing weather conditions. The new plane is the first experimental jet NASA has built in more than a decade. BOBBY BRAUN: The thing that I'm most excited about actually is that NASA is moving back to this hexplane concept. PALCA: Bobby Braun is dean of engineering at the University of Colorado Boulder. He says experimental planes have been crucial to advancing aviation. BRAUN: It wouldn't surprise me at all if, say, 10 years from now that we're back flying supersonically. PALCA: NASA has signed a $247.5 million contract with Lockheed Martin to actually build the new hexplane. It expects delivery in 2021. Joe Palca, NPR News. J J FAD: (Rapping) Supersonic, supersonic - supersonic motivating rhymes are creating, and everybody knows... Transcript provided by NPR, Copyright NPR.